How would you like a chance to win a cash prize? 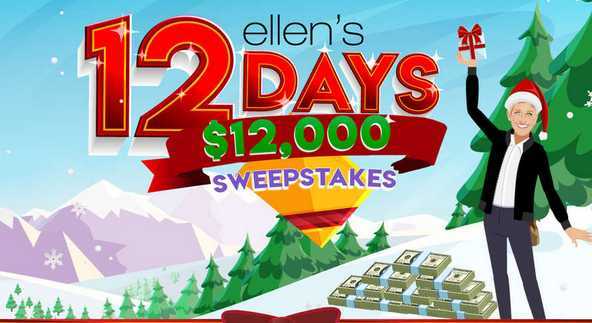 Enter into the Ellen Shop 12 Days $12K Sweepstakes Giveaway now through December 12, 2018 for your chance to win $12,000 cash prize. How To Enter: During the giveaway period place an order on ellenshop.com that is Forty US Dollars ($40.00) or more and you will automatically be entered into the Sweepstakes, Now go to this link: ellenshop.com/pages/12K and follow the online instructions to register by entering all information requested on the registration form for your chance to win. Prizes: One lucky grand prize winner will receive a onetime payment of Twelve Thousand US Dollars cash prize ($12,000). Total ARV of all prize is $12,000. When To Enter: This sweepstakes entry begins on November 21, 2018 at 10:00 a.m. (PST) and ends December 12, 2018 at 11:59:59 p.m. Pacific Time. Who’s Sponsor: The Ellen Shop 12 Days $12K Sweepstakes is WAD Productions 3500 W. Olive Avenue, Suite 1000, Burbank, CA 91505.